The moon is something that our society has been fascinated with for a long period of time. New missions have been worked on in order to make the moon a tourist attraction. A recent novel called “Seveneves” by Neal Stephenson brings up a possibility that not many of us have considered-the exploding of the moon. Although we may never know what will happen if the moon explodes, scientists have given us some sort of idea regarding this scenario. 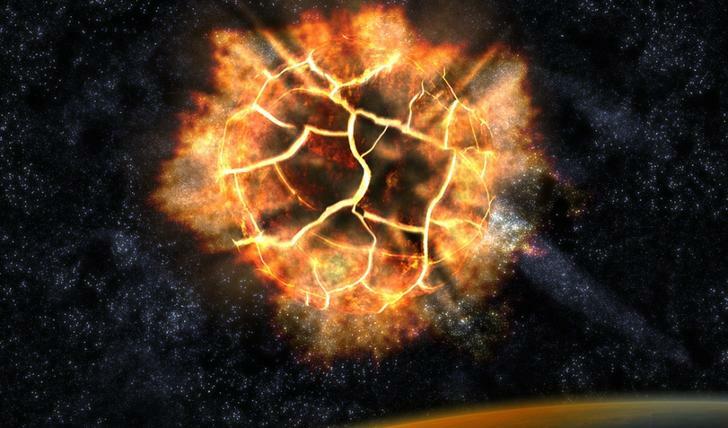 A group of physicists have in fact come up with some idea of what we can expect if the moon ever does explode. What causes the moon to be destroyed would be important because it would allow us to know how big the pieces of the moon would be, how fast they are going and where exactly they are headed. It would be difficult to blow up the moon ourselves, and there could be various outcomes of it. Daniel Freeman, a graduate physics student at UC Berkeley gave us one possible explanation of what could cause a moon explosion. He explained that a rogue planet, which is considered to be, “not gravitationally bound to any particular solar systems — planets that essentially are just hurtling through space," could crash against the moon which would then destroy the moon. It should also be said that the stars are outnumbered by these rogue planets 100,000 to 1. But what happens after the death of the moon, when pieces of it and large fragments of iron head towards our world is what is really frightening. In “Seveneves” the majority of the pieces stayed in the vicinity of where the moon is, but one large piece crashes into another which broke it off into smaller pieces. The character Doc Dubois, an astrophysicist realizes that as the pieces of the moon continue to crash into each other, more pieces will break off which means even more collisions. This is known by our scientific community as Kessler syndrome which is why some researchers are scared of too much junk in our orbit. Physicist Erik Asphaug stated that it is possible that if this happens, it could happen, "the Moon's debris would form a torus [like a doughnut-shaped ring] around the Earth, and large chunks could be forced inwards by tides and dragged gravitationally by resonances with torus material." After this ring around our world, it would cause a rain of darkness and destruction that could last thousands of years. Asphaug shared, "I think the end game would be some initial [random] impacts on the Earth, by stuff that just happened to be heading the right (or wrong) way followed by massive bands of impacts for some longer time, perhaps by a flattened ring with impacts concentrated equatorially, but maybe not flattened in which case impacts on Earth would be everywhere." In the novel, they planned to create space colonies in order to survive, and although that idea may seem far-fetched, it may be the only thing that allows us to survive.